On December 14, 1995, workers at the Oconee nuclear plant in South Carolina were moving irradiated fuel assemblies in the spent fuel pool. 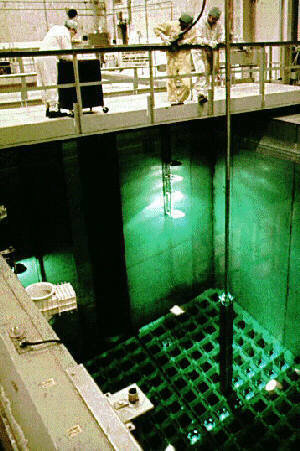 The picture shows workers at a typical nuclear plant using a mast extending downward from the refueling platform spanning the spent fuel pool to move an irradiated fuel assembly. When they finished for the day, an irradiated fuel assembly remained suspended from the refueling bridge mast. Workers did not return to the refueling floor the next day, or the day after that. In fact, the fuel assembly was still hanging three weeks later. The lonely assembly was finally placed into a storage rack on January 8, 1996. The NRC fined the plant’s owner $50,000 for its forgetfulness. The NRC observed that had an accident occurred at the plant while the irradiated fuel assembly was left dangling, operators following emergency response procedures could have pumped water out of the spent fuel pool. This could have uncovered the irradiated fuel assembly. An uncovered fuel assembly may have overheated and melted. Even if had not melted, an uncovered fuel assembly could have produced very high radiation fields in the fuel building that could have endangered plant workers responding to the emergency. The plant’s owner remembered to pay the fine. The mast is used to move irradiated fuel assemblies from A to B. It is not a valid storage location. Thus, the last movement on December 14, 1995, should have ended with that irradiated fuel assembly in location B, not suspended en route. Fuel movements are not left to one individual. At least one other worker must verify that the movement moved the correct fuel assembly from the correct starting point (location A) to the correct endpoint (location B). At least two workers then sign off that that step has been completed. There can be no provision for leaving the refueling platform with a fuel assembly on the mast instead of in location B. The NRC acted properly by sanctioning the plant’s owner for this complete breakdown in controls for irradiated fuel movements.